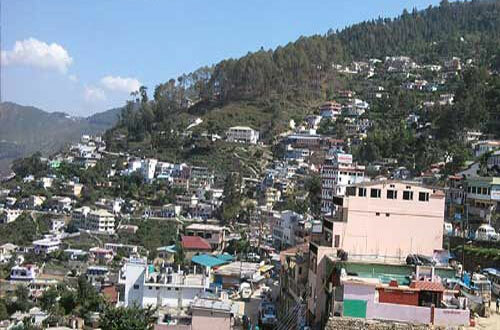 Pauri Garhwal is a district in Uttarakhand state of India. Its headquarters is at Pauri. Pauri Garhwal district is ringed by Haridwar, Dehradun, Tehri Garhwal, Rudraprayag, Chamoli,Almora and Nainital districts from three sides. The southern boundary of Pauri Garhwal district touches with the Bijnor district of Uttar Pradesh. This district falls partly in the Gangetic plains and a major part in the Himalayan North. 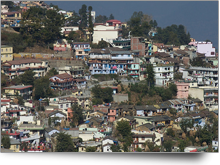 Pauri Garhwal district was a part of the erstwhile Garhwal Kingdom ruled by the Pal (Shah) dynasty. The throne of the King was at Srinagar. In 1803 Gurkhas, after many unsuccessful attempts, finally succeeded in capturing Garhwal by defeating the army of King Pradyumna Shah. In 1816, the British defeated the Gurkhas in the Anglo-Nepalese War, and the Garhwal Kingdom was re-established from Tehri.Village andkil is the smallest village in pauri garhwal.Andkil is the smallest village in pauri garhwal district with a population of under 50.Its near ekeshwar main market. The present king of Kumaon kingdom is Raja Mahendra Chand of Lamakhet, he is married to Rani Gita Chand of Rina and has three children. (Rajkumari Aakanksha Chand, Rajkumari Mallika Chand, Rajkumar Aryan Chand). History of Pauri Garhwal District suggests that through the ages, the evolution of human civilization in this region of Garhwal Himalaya has been parallel to the rest of Indian sub-continent. Katyuri was the first historical dynasty, which ruled over unified Uttarakhand and left some important records in the form of inscriptions and temples. In the later period after the downfall of the Katyuris, it is believed that the Garhwal region was fragmented in more than sixty-four principalities ruled by a chieftain, one of the principal chieftainship was Chandpurgarh. In the mid of 15th century A.D. Chandpurgarh emerged as a powerful principality under the rule of King Jagatpal (1455 A.D to 1493 A.D.), who was a descendent of Kanakpal. Towards the end of 15th century AD King Ajaypal enthroned Chandpurgarh and ruled the region. Subsequently, his kingdom came to be known as Garhwal and he transferred his capital from Chandpur to Devalgarh before 1506 AD and later on to Srinagar during 1506 to 1519 A.D.
King Ajaypal and his successors ruled the region of Garhwal for nearly three hundred years even during this period they had faced a number of attacks from Kumaon, Mughals, Sikhs and Rohillas. An important event in the history of Pauri Garhwal District was Gorkha invasion. It was marked by extreme brutality. After conquering Doti and Kumaon, Gorkhas attacked Garhwal despite stiff resistance put up by the Garhwali forces. But in the meantime, news came of a Chinese invasion and the Gorkhas were forced to lift the siege. However, in 1803, they again mounted an invasion. After capturing Kumaon, they attacked Garhwal in three columns. Eventually, the Gorkhas became the masters of entire Garhwal in 1804 and ruled the territory for twelve years. The rule of Gorkhas in Garhwal area ended in 1815 after the British invasion in the region. After the defeat of Gorkha army, the British rulers on 21 April 1815, decided to establish their rule over the eastern, half of Garhwal region, which lies east of Alaknanda River and Mandakini river. The remaining part of Garhwal in the west was restored to King Sudarshan Shah who established his capital at Tehri. Initially the administration was entrusted to the commissioner of Kumaon and Garhwal with headquarters at Nainital, but later Garhwal was separated and formed into a separate district in the year 1840 under an assistant commissioner with his headquarter at Pauri. In early 1960, Pauri Garhwal District and Chamoli District was curved out of Garhwal district. Tourism in Pauri Garhwal District includes a number of exploring options.Pauri Garhwal is considered as nature's paradise and it attracts people through its charm and magnificence.The beautiful valleys,snow clad mountain peaks and the amazing vies of the nature are the key components that attract the travellers.Moreover,tourism in Pauri will bw considered incomplete without paying a visit to its ancient temples.Some of the main places of interest in Pauri are as follows. Jai Danda Nagraja Mandir : The holy shrine of Danda Nagraja is a very popular pilgrimage among the Garhwali people. Devotees from around the country throng to the shrine everyday. 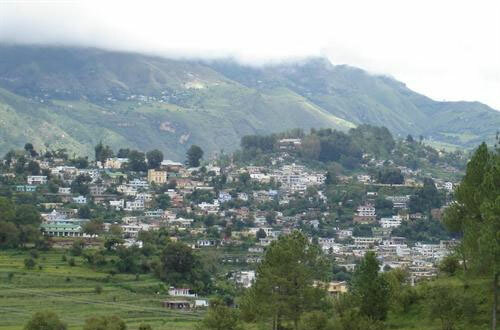 It is located in the Kandwalsyon Patti, District Pauri (lap of Mountains). Deboarding the bus at Maroda bus stand distance of 9 km run from Devparyag. MARODA Village is located on the foot-hills of the Shri Daanda Nagraja Temple. The traveler treks on foot on uphill way up to 10 km. Shri Danda Nagraj is one of the most famous temples in the Pauri Garhwal district of Uttrakhand. The temple is situated in the Patty Kandwalsyon. Every year thousands of pilgrims from across the country visit this holy shrine, especially people from villages who have a lot of belief in the healing powers of this deity. The famous Kauthig festival is celebrated on a very grand scale every year in 13-14April. 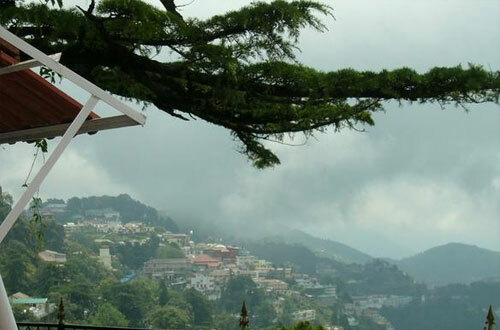 The shrine is now well connected from Pauri City and other districts of the State by regular bus services. The best seasons to visit this Krishna temple is from November to March. “Legend has it that when Lord Krishna came here for the first time, he came in the form of a snake and crawled all the way up the ridge to reach the spot where the temple now stands. Hence this temple is called Shri Danda Nagraj Temple.” a regular pilgrim to this shrine, PUJARI OF Shri Danda Nagraj TEMPLE'S said. Localites have a strong belief that Lord Krishna still stays here and has done so over many centuries. They say they have special blessings of Danda Nagraja. Popular faith is that Danda Nagraja has the power to foresee any ill coming to the area and always informs them about any mishap that is about to occur. Not just that, locals say the Lord also gives them the solution to the problem. The temple’s high priest tells you with conviction that if any devotee prays sincerely, Danda Nagraja always fulfills his wishes. The temple is situated at the top of a hill with ample space around the structure for the pilgrims to relax. Another unique feature of this temple is that thousands of bells are tied in the temple premises by devotees after their wish is fulfilled. Apart from this, there is also a custom of devotees offering jaggery (gur) as prasad to the reigning deity. After a darshan of shri Danda Naagraj, the pilgrims take a parikarma of the temple to get the blessings of the God. “The temple not only attracts local people but, every year, many foreigners come visiting and they donate bells with their names written all over. The main visitors are from the US and UK,” the priest tells you. People who lives in villages they have sacred belief in Danda Nagraza Temple. It is said that there are so many folk stories behind the establishment of temple. Jai Danda Nagraza Temple has been healing the grieves of Millions of devotees in many magical and holy way and that is what tied those devotees into a bond of love between God and Pilgrims since ages. With the help of this temple Pauri Garhwal known as a "Land of Miracles". The State Government is doing its best to bring this temple into the world tourist map. The condition of roads has improved, dharamshalas and other tourists shelters are coming up and transportation and other basic facilities are being introduced. Jwalpa Devi Temple : This is a famous shaktipeeth of garhwal dedicated to Goddess Jwalpa. It is situated on the Right Bank of the Nawalika River, 34 km from Pauri, on the main Pauri- Kotdwar road. According to a legend in Skandha Puraan, Sachi(daughter of the demon king Pulom) wanted to marry devraj Indra so she worshipped The Supreme mother Goddess 'Shakti' here at this place. The Goddess then appeared in the form of Deeptimaan Jwalehwari and her wish was fulfilled. This name then gradually as the time passed was cut short and moduled to Jwalpa Devi. Adi Guru Shankaracharya visited and prayed in this temple and it is said that The Goddess appeared to him. Every year Navratri fair is held twice, on the occasion of Chitra and Shardiya Navratri. Anthwals are the traditional priests and care-takers of this temple as the present temple was constructed by Late Pt Shri Dutta Ram Anthwal(Anthwals being the zameendaar of the area, originally from village Aneth). Every year thousands of people visit this temple, specially unmarried girls as it is said that the girls get fine grooms just like Indraani(sachi) got Lord Indra by the grace of The Goddess. Kandoliya Devta : The main temples of the city are Kandoliya Devta, Laxmi Narayan, Kyunkaleshwar Mahadev and Hanuman mandir. Every year, a ‘Bhandara‘ is organized in the premises of the Temple of the Kandoliya Devta and thousands of people from Pauri and near by villages participate in it. The city is blessed with a number of picnic spots surrounded by ‘Deodar‘ forests and filled with natural beauty viz. Ransi, Kandoliya, Nag Dev, Jhandi Dhar etc. Every year ‘Sharadotsav’ is celebrated in the city since 1974. Shoonya Shikhar Ashram : This is one of the prime spiritual centers near Kotdwara. One can reach there after 7 km trekking from a village Balli, around 35 km up the hill from Kotdwara. Shoonya Shikar Ashram is known for the meditation cave of Sadguru Sadafaldeo Ji Maharaj .It attracts people from all over the world, in particular the followers of Vihangam Yoga, seeking high level meditation. This is the place where 'Swarved' was created. Kyunkaleshwar Mahadev : It is an 8th century temple dedicated to Lord Shiva offering astonishing views of the snow laden Himalayas.The temple is situated in the suburbs of the main town Pauri.The presiding deity of the temple is Lord Shiva accompanied by Goddess Parvati,Ganesha and Karthikeyan. Chaukhamba View Point Situated only 4 km from Pauri.Chaukhamba View Point ridge overlooks the splendid idwal valley and Chaukhamba Peaks.It is one of the prominent places of Pauri because of its mesmerizing scenic vistas. Khirsu : The snow-covered mountains of Khirsu offer a panoramic view of the Central Himalayas and attract a large number of tourists. From here one can get a clear view of many named & unnamed peaks. Located 19 km away from Pauri at an altitude of 1,700 m, khirsu is a peaceful spot, free from pollution. Only the chirping of birds breaks the tranquility of the adjoining thick Oak and Deodar forests and apple orchards. The ancient temple of Ghandiyal Devta in the vicinity is well worth a visit. Accommodation is available at the Tourist Rest House and Forest Rest House. Binsar Mahadev : Amidst the dense forest of Birch, Rhododendron and Deodar, is located the temple of Binsar Mahadev at an altitude of 2480 m and is at a distance of 114 km from Pauri. Sanctorum of temple consists of deities, Hargauri, Ganesh and Mahisasurmardini. Temple is believed to be constructed by Maharaja Prithu in memory of his father Bindu. This temple is also known as Bindeshwar temple. A big fair takes place here on the occasion of Baikunth Chaturdashi every year.Binsar Mahadev is 24km by trek from Thalisain. Doodhatoli : Doodhatoli, Situated at an altitude of 3100 m, is covered withdense mixed forest. Thalisain is the last bus terminal (104 km. from Pauri) from where Doodhatoli is at a distance of 24 km. by trek. It is one of the most picturesque places and offers a panaromic view of the Himalayan ranges and the surrounding areas. Tara Kund : Situated at a height of 2200 m. Tarakund is a small picturesque spot amidst lofty mountains in the Chariserh Development Area. A small lake and an ancient temple adorn the place. The Teej festival is celebrated with great gaiety when the local people come here to worship and pay homage to God. Kanvashram : According to a famous believe this is the place where the great sage Swami Vishwamitra meditated and the beautiful heavenly damsel Menka disturbed him. This place is situated at a distance of about 14 km from Kotdwar, and has a great historical and archaeological importance.